Posted by mwidlake in development, Friday Philosophy, Perceptions, Private Life. I should mention, neither Jim or Richard are dyslexic as far as I know! A recent, slightly jokey, conversation on twitter reminded me of the issues I have had in typing the wrong thing (over and over and over again – my usual example is how often I have tried to “shitdwon” an oracle instance). And that in turn reminded me of a more serious conversation I had when at the OUG Ireland conference back in March. As a developer, I sometimes struggle to spot spelling mistakes or use of the wrong (or missing) punctuation in my code. As my friend JimTheWhyGuy said in the twitter conversation, spotting you had spelt UDPATE wrong. I was telling the audience that I was something of a slow developer, partly due to dyslexia. I can stare at code for ages, especially if I am using a new construct to me, not understanding why I am getting an error. It is often not a syntax problem but a spelling one. I had real problems with the word “partitioning” (and still do) when I started using that feature. – it is a little long and has almost-repeated sections in the middle and I “spin” in the middle if I read it or try to write it. It’s a little too long for my wrists to learn to automatically tap it out. After the talk a lady came over and asked me if I had any advice on how to reduce the impact of dyslexia when writing code. She’d been diagnosed at school and so had grown up knowing she was dyslexic. (I was not diagnosed as a child, which oddly enough I am still glad about – as I learnt to cope with it in my own way. But I am NOT glad I am dyslexic). I do not know what support and advice she had been given through school, but it was obviously still something that impacted things. All I could come up with were a couple of tricks I use. One is to copy text into MS Word and see if it highlights anything. You have to teach your version of MS Word (*other word processors with spell checkers are available) that the normal syntax words are real, but all the punctuation and special characters get in the way. Where it does help a lot is reducing the number of errors in specifications & documentation I produce and, now, articles I write. But as I know most of you who come by here have already realised – spelling errors that give another correct word are not picked up by a lot of spell checkers, such as this WordPress site. My blogs are full of missing words, wrong words and other crap. The other major advance is the use of, Software Development Tools (SDTs – and YES, I spelt SDT wrong first time around writing this!) or Interactive Development Environments (IDEs). These highlight syntax errors (so highlighting typos), allow auto-completion of command words and provide common code constructs. They help, but I’ve never been that good at getting the best out of them. I use SQL*Developer more than the others and it does help. The final other thing is that I just factor in that it’s going to take me more time to write or read stuff. Like many dyslexics, there is nothing wrong with my comprehension (I went off the scale for reading age when I was 12) but it takes me longer and is more effort. Looking around on the web about this, there is a lot of stuff, the above point about IDEs being a main one. One common thing is to use different fonts to help stop letters skipping about or moving, but I don’t have that sort of dyslexia so I’ve never looked into that. 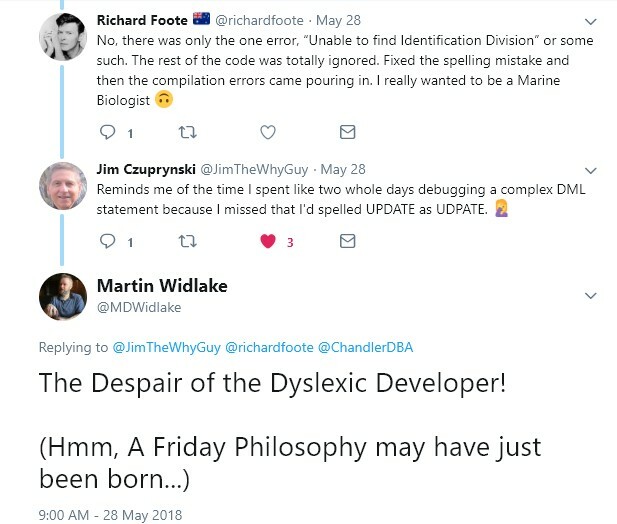 I was going to review the topic of dyslexic developers more before putting this article together, but reading it all was taking me too long! That and I found the constant “It gave me an advantage” to be bloody annoying. So, knowing a few of you out there are also dyslexic to some degree or another, have you any tips to share? If you have something to share but do not want to be identified, contact me directly. I’d really appreciate it, if not for me then for if ever anyone else asks me how I cope as a dyslexic developer.